Every month we receive hundreds of feedback posts on our Trust Pilot Reviews page, so, as a thank you to all our amazing customers who have taken the time to contribute to our overall satisfaction rating of 9.0/10, each month we pick one lucky reviewer and gift them a £15 Amazon voucher. 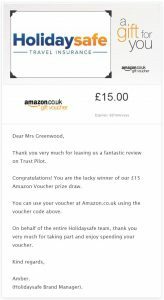 If you’re a Holidaysafe customer who would be interested in receiving a £15 Amazon voucher, all you have to do is visit our Trust Pilot Evaluation page and leave your honest feedback on our products, prices and services. Once you review is posted your name will automatically be entered into our prize draw for that month.